Let's face it. Glorious plumage not withstanding, I'm an odd bird (and that's just fine by me). 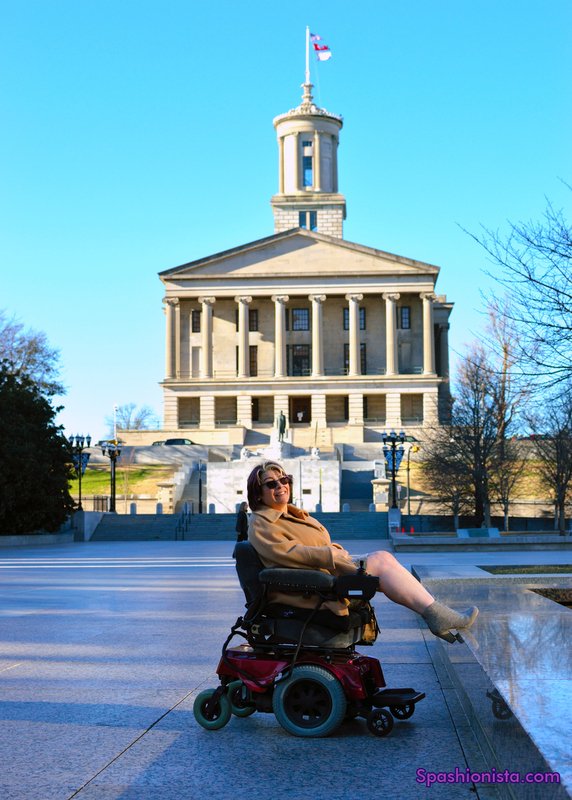 I often forget how unusual it must be to see a lady in a wheelchair striking poses for photographs all over Nashville. The outfit, is basic, classic and neutral. That doesn't mean it's frumpy or boring. A leopard wool pencil skirt from Couture for a Cause, grey cashmere sweater from Goodwill, and vintage camel cape from Pura Vida Vintage. Admittedly, the booties are not to be ignored. The sparkly cowboy-heeled ankle boots are from Off Broadway shoes, and they twinkled - they truly did - in the sunlight. So did the clip-on earrings from Margaret Ellis Jewelry. I just can't wear post earrings so I'm grateful that one of my favorite jewelry designers creates clip-ons I can sport whenever the mood strikes me. I think they go well with this outfit, as does the inimitable Tiffany heart key. These photos were taken at Legislative Plaza towards the end of the working day, and I got a fair amount of side-eye from people leaving their offices. I expect that (who wouldn't?) and I enjoy talking to people that ask me what I'm doing or compliment me on my outfit. After all, visibility and positive interactions are the cornerstone of what I do. What I don't appreciate are conversations filled with politically correct phrases delivered in a condescending manner. Using a soothing tone of voice while calling me "differently-abled" because I'm wheelchair dependent, and "brave" for dressing up and having my picture taken, is just as offensive as implying I'm lazy and have it easy because I "found someone who will take care of" me. None of these things are appropriate small talk - or any talk, for that matter. More importantly, they are inaccurate ways of characterizing most people with disabilities. As the late, great George Carlin once said, "We're all differently-abled". Also, I don't consider myself to be a brave person. I'm kind of a closet coward. But, unless it's below freezing or in the upper 90's it doesn't require bravery to strike a pose. Granted, some days my body fights me over unfurling from the fetal position, but that requires concentration, not bravado. As far as the remarks about my relationship are concerned, any lasting relationship - romantic, platonic, business or otherwise - has to be about give and take. It's easy to assume that my physical limitations make me a "taker", but if you know me you know I do just as much for my better half as he does for me. The perceptions about disability are what need to change, and that's what I strive to do every time I interact with someone who, for whatever reason, just doesn't "get it". Although it is ultimately their choice I have found that the majority of people do respond positively when I politely challenge their stereotypes regarding disability. More often than not, they just didn't know any better. This is the year we change Nashville's perceptions about people with disabilities in a big, big way. I'm cooking something up, and I'll tell you all about it right after Nashville Fashion Week. Speaking of which, do you have your all-access pass yet? If not, get it here. What about you? Are you often faced with misconceptions about your own situation that you wish you could change?